Butterfly Weed Hello Yellow Asclepias Tuberosa is a yellow blooming variety of Butterfly Milkweed. 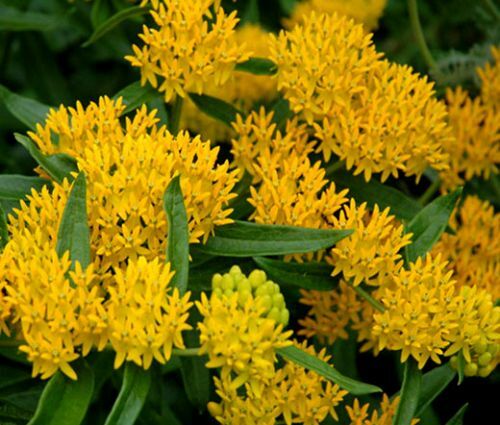 Butterfly Weed seeds are easy to grow, and this particular Asclepias Tuberosa features attractive foliage with slender narrow lives producing huge clusters of golden yellow flowers on a top of clumping stiff stems. Butterfly Weed Hello Yellow blooms all summer and fall attracting butterflies and hummingbirds. Butterfly Weed Hello Yellow is the source of yellow color in butterfly gardens. Butterfly Weed looks wonderful in the mixed borders and meadows. Asclepias Tuberosa seeds are easy to grow, and Butterfly Weed prefers full sun but tolerates partial shade. The plant is adaptable to poor soil and harsh conditions such as drought, heat, and humidity. Not only the Butterfly Weed flowers looks exceptional in cut arrangements, either fresh or dried, but their dried seedpods are highly decorative and often used to create an accent in dried bouquets.